The Hawaiian Islands are at the southeastern end of a chain of volcanoes that began to form more than 70 million years ago. Many of these volcanoes formed islands that have subsided and eroded beneath sea level, and some of the old volcanoes probably never reached sea level. Each Hawaiian island is made of one or more volcanoes, which first erupted on the sea floor and only emerged above the ocean's surface after countless eruptions. The largest and most southeastern island of the chain, Hawaii, consists of five volcanoes. Kilauea, Mauna Loa, and Hualalai have erupted in the past 200 years. Lo`ihi, the youngest volcano of the Hawaiian Volcanic Chain, is still about 1,000 meters beneath the ocean's surface. East Maui Volcano, commonly known as Haleakala, on the island of Maui, is the only other Hawaiian volcano to have erupted since the late 1700's. How many Hawaiian Island are there? 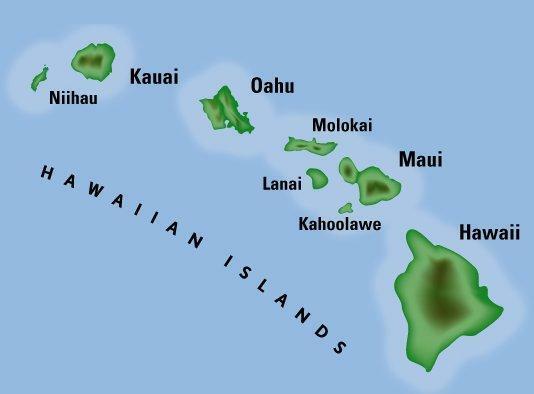 There are 8 main islands, which make up the state of Hawaii (Hawaii, Maui, Oahu, Kahoolawe, Lanai, Molokai, Kauai and Niihau). There is one additional small island (Kaala) near Niihau that is often overlooked. The outer Hawaiian Islands (aka the Northwest Hawaiian Islands) are a series of 9 small, older land masses north of Kauai that extend from Nihoa to Kure and which are the above sea level remnants of once much larger volcanic mountains. Together these make 18 commonly accepted islands. Depending on how you count them, there are also more than a hundred additional small rocks and islets among the Hawaiian Islands that are either volcanic, marine sedimentary or erosional in origin, which when combined with the other 18, total to perhaps as many as 130 or so in the entire Archipellago.